To help keep ahead of the growing challenges of explosives and narcotics detection, the MobileTrace® handheld packs the advanced capabilities of simultaneous dual-mode detection into a powerful, user-friendly trace detector. MobileTrace®, the first simultaneous dual-mode detector, expands the range of target explosives that can be identified in a single sample for faster, more comprehensive security screening. Rapiscan® Systems patented Ion Trap Mobility Spectrometry (ITMS™) technology offers the detection, sensitivity and reliability proven at military bases, border crossings, airports, and other critical security checkpoints around the world. MobileTrace® graphical interface is intuitive and easy to learn for new operators. SelectScan for a simple list of alarm/no alarm status of substances in the library. Peaks view for a tabular form of time-of-flight and height of peaks detected. Plasmagram for a graphical representation of peaks detected. 3-D view and Intensity Map for analytical interpretation (not shown). To accommodate a range of lighting situations, MobileTrace® is designed with adjustable display brightness. Three default user levels (operator, maintenance and administrator) for access control. State-of-the-art networking capability and USB connectivity. ITMS™ desktop software enables file management, analysis and printing. Option to use substance codes instead of substance names for privacy and security. Expandable libraries accommodate unique user requirements. 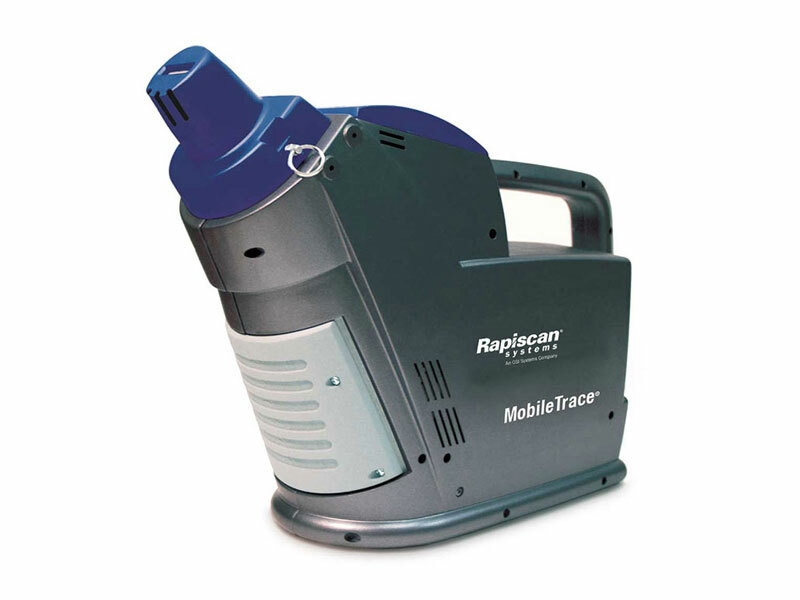 MobileTrace® gives you the flexibility to swipe surfaces for trace particles or to analyze vapors. Particle swipe: MobileTrace® conveniently uses standard Rapiscan® Systems sample traps. The Teflon®-coated traps are swiped across a surface and inserted into the system for analysis. Typical sampling objects include clothing, skin, baggage, cargo, vehicles, containers, tickets and ID cards. Vapor sampling: Vapors are drawn through a nozzle directly into the system for analysis. Typical sampling objects. Touch screen with text or icon menus, 800 NIT 3.5 in. (8.9 cm) color, glare resistant display. Navigation pad, touch screen keypad and optional keyboard. Easy access to components for efficient maintenance.